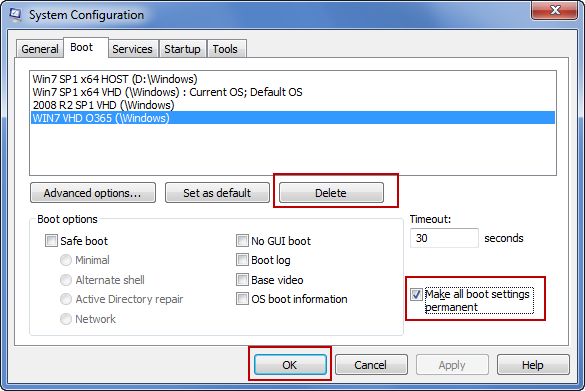 If you have created extra menu items in your windows boot environment that you no longer need, you can delete them. Deleting can be impossible if you do not know the tools and tricks. But if you do, it is super simple. There are two ways to achieve the same result one is with BCDEdit and the other is MSConfig. For this article, I am going to just focus on MSConfig. 3) Caution: The following is a destructive and there is no UNDO so make sure you double check everything. 6) You will get a restart prompt, you can restart now or later. This Just deletes the menu option, it does not delete the files associated with that menu option. Therefor you will have to do that manually.